MANY GREAT USES. Use for hair, facial mister, houseplants, succulents, ironing, cooling yourself on a hot day. SPRAYS LIKE AN AEROSOL WITHOUT BEING AN AEROSOL. Completely refillable and reusable. No aerosols, no propellants. Use as an atomizer. 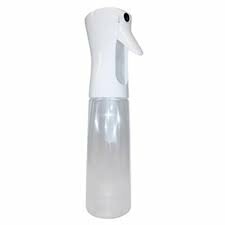 MEDIUM 10 OZ BOTTLE, WHITE SPRAYER. White pump sprayer with clear bottle. Holds 10 ounces of liquid.